when we shared a house in O'Connor, ACT (Jane). Combine all ingredients - I like to put into a jar and give a good shake. Can be made ahead and stored in the fridge. May need to be brought to room temperature to serve. Other suggestions: cucumbers, dill pickles, artichokes, cooked asparagus, olives etc. 1. 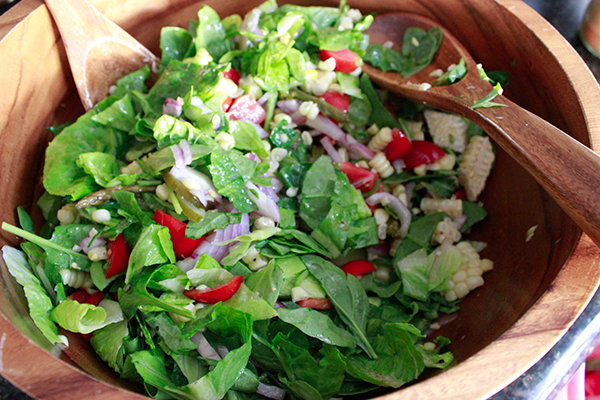 Combine salad ingredients in large serving bowl. 2. Pour over salad dressing - but not too much, toss gently - and serve! 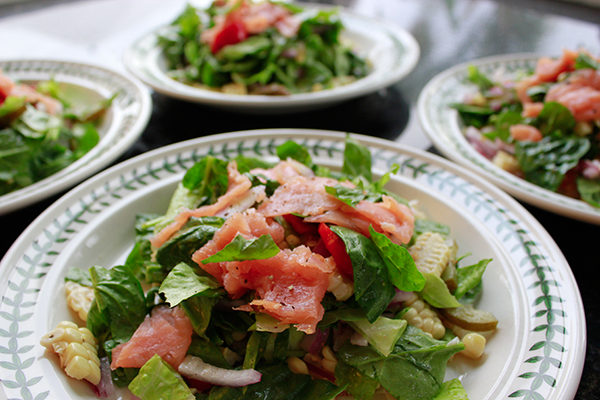 Salad can be the main meal - especially in the summer. Add some protein - smoked salmon, canned salmon or tuna, left over BBQ chicken or beef, canned beans - cannellini or garbanzo (chickpeas) - even some nuts - pine nuts, walnuts or pecans. We aren't fans of cheese in salads. Nicoise salad - add chopped, cooked potatoes, cooked, chopped green beans, some black olives, a quartered boiled egg and a can of tuna. Leftover veges - corn, asparagus, potatoes, etc - whatever you have! Craving some carbs - serve with fresh crunchy bread! Once you make your own salad dressing you'll never go back to store bought.